1. Business Opportunities: Reading business opportunity, Capturing business opportunities and Leveraging business opportunities. 2. Risks of business: Entrepreneurship failure, Ability to manage time. 3. Innovation: The ability to innovate, Ability to develop business. 1. Look confident: Be independent, know your abilities. 2. Leadership: Be disciplined, Respect the opinions of others, Ability to find ideas. 3. Future orientation: Motivation for the future, Future planning. 4. Orientation on assignments and results: Accuracy in gathering assignments, working on tasks with your abilities. Affective Domain, Entrepreneurship, Instrument Development, Learning Assessment. Indonesia is the country with the fourth largest population after China, India and the United States as many as 251,543,400 inhabitants. The richness of nature and the diversity of tribes and cultures became a vital asset owned by Indonesia. Natural wealth owned by Indonesia has not been able to free Indonesia from economic problems. For example, the issue of poverty that reached 10.7%. In addition to poverty, Indonesia is also faced with unfinished unemployment problems. The growing number of people while the number of available employment is limited makes the unemployment rate in Indonesia is still high. The government continues to push the unemployment rate. One way is to instill and float the soul and entrepreneurship interest in the community. The high percentage of entrepreneurs in a country can be a reference for economic development. Developed countries have a far greater number of entrepreneurs than developing countries and emerging countries (Vivarelli, 2012; Hendro, 2011). Entrepreneurs in Indonesia are currently only 1.5% of the total population. Indonesia still needs 1.7 million entrepreneurs to reach two percent. While in ASEAN countries recorded Singapore has 7% entrepreneurship, Malaysia as much as 5%, Thailand 4.5% and Vietnam has 3.3% of entrepreneurs of the total population. The underdevelopment of entrepreneurs in Indonesia is caused by certain attitudes, mindsets, or judgments in society (Astamoen, 2008). Unlike what happened in developed countries like America. They have a great desire to open their business opportunities. The desire to succeed and accumulate wealth from the company he founded. In another aspect, the courage to entrepreneurship is also encouraged by school teachers and schools that provide entrepreneurial subjects. The learning materials are packed as attractive as possible to cultivate the interest of entrepreneurship students. This happened to MIT alumni, Harvard University and other colleges (Alma, 2011). The growth of interest in entrepreneurship also needs to be instilled early in the child. One of the most effective places to foster entrepreneurship interest is through education. According to researcher, entrepreneurship education will be able to generate a large national impact if this entrepreneurship education can generate four million new entrepreneurs over the next 25 years (Of & Japanese, 2012). Schools as educational institutions are expected to be able to form independent young entrepreneurs. According to Bandura in the social learning theory provides an understanding of predictions, and changes in human behavior through interactions between humans, behavior, and the environment (Bandura, 1971; Bandura & R.H. Walters, 1963). The school environment is important to be designed by presenting real problems and future challenges that students will face. Entrepreneurial learning can be carried out contextually with the problem-based learning, discovery, or project-based learning method so that students can form knowledge, understanding, and alternative entrepreneurial practices. The affective domain in entrepreneurship learning is fundamental to be developed and evaluated with dimensions including attitudes and values in a person. In Theory Reasoned Action, a person's intention towards behavior is formed by two main factors, namely certain behavioral attitudes and subjective norms. Attitude is an evaluation or evaluation of a positive or negative person against some beliefs about a particular object (Fishbein and Ajzen, 1975). Theory of Planned Behavior, an extension of the theory, reasoned action adds perceived behavioral control which is the perception of ease or difficulty in fulfilling behavioral interests (Ajzen, 1991). The importance of attitudes and measurements is developed by Azwar that attitude is a phenomenon that arises in addition to being determined by the state of the object being faced also determined by experience. Learning Value in students, as well as the provision of entrepreneurship, is critical. Entrepreneurial values with self-knowledge, imagination, practical knowledge, search skills, foresight, computational skills, communication skills are the analysis of curriculum development and evaluation needs. According to Robert D. Hisrich, Entrepreneur is the process of creating something new with value by devoting the Necessary time and effort, assuming, the Accompanying financial, psychic, and social risk, and receiving the resulting rewards of monetary and personal satisfaction and independence. The 2013 curriculum in Indonesia contains the subjects of Workshops and Entrepreneurship contained in lessons at equivalent high school level (Pendidikan et al., 2013). This is realized as an effort to foster the entrepreneurship spirit in high school students as stated in one of the learning objectives of the workshop and entrepreneurship. Students are not only prepared to master science alone but also need to be prepared to see and take advantage of opportunities that exist around. In other words, students have been taught to open opportunities and opportunities for themselves and others. Learning has three important aspects that are done by the teacher that is the preparation stage, teaching, and evaluation. This study focused on the evaluation of learning by educators to learners. Assessment by the teacher is a form of assessment that refers to the evaluation of the domain of knowledge, attitudes, and skills in a balanced manner. But in reality on the ground shows that many teachers who have difficulty understanding the way of assessment in the curriculum 2013. Likewise, what happened in the lesson of the workshop and entrepreneurship? The assessment is more focused on cognitive and psychomotor assessments. Attitude theory to map to entrepreneurially behaviors components. Attitude characteristics supplement skill-based assessments, and attitude approaches may allow for a more complete exploration of entrepreneurship (Fernandez et al., 2015). The term assessment in English is known as evaluation or evaluation. Measurements are made of the attributes or dimensions of several physical objects, using standard instruments that develop based on the development and validation of tools from experts (Adams & Wieman, 2011). According to researcher, assessment is a systematic process of collecting, analyzing and interpreting information to determine the extent to which students achieve goals (Jihad and Abdul, 2010). While the assessment according to Government Regulation No. 19 of 2005 on National Education Standards, article 1 (17) stated that the assessment is the process of collecting and processing information to measure the achievement of learning outcomes of learners. Bloom defines evaluation as a systematic collection of facts to determine whether there is a change in students and determines the extent of the rate of change in the student's personal (Daryanto, 2008). While researchers define evaluation as the process of planning, obtaining, and providing the information necessary to make decision alternatives. Assessment done in learning includes three domains of cognitive, affective, and psychomotor domains. In this research and development, researchers focused on the affective domain. According Sudijono affective domain is a domain that is related to attitudes and values. Meanwhile, there are four types of critical affective characteristics proposed by Mardapi, namely attitudes, interests, values, and self-concepts (Mardapi, 2012). But in this study, researchers will use the opinion of Kunandar who argued that the assessment of effective areas includes attitudes and values (Kunandar, 2014). 1. Cognition is a situation where a person has a belief about what is applicable and what is right according to him. 2. Affection, an issue that concerns an emotional or a person's feelings towards an object. 3. Konasi, a certain tendency to behave following what he believed. Research on attitudes and predictions about the future of students in entrepreneurship is done in several countries (Noor & Shariff, 2009; Fitzsimmons, 2005) but the assessment and measurement of the affective domain of the entrepreneurial learning process is important to be developed as feedback for the teacher in evaluation to increase student knowledge and learning gives teachers useful information about how to improve their teaching methods (Jabbarifar, 2009). Meanwhile, the value is defined by Rokeach as a belief in deeds, actions, or behavior that is considered good or bad (Lovrich, 1998). Feather states that Value has been described as a belief about how to behave and what goals are important to be achieved (Halis et al., 2007). Farkas describes the relationship between values as external aims balance and behavior, correlates diverse behaviors with the environment (Farkas, 2015), so that entrepreneurial learning that is designed with good values and environment will have a behavioral impact on students. Entrepreneurial ability oriented in entrepreneurial values are self knowledge, magination, practical knowledge, search skills, foresight, computation skills, communication skills (Suryana, 2006). 3. Oriented on tasks and outcomes. 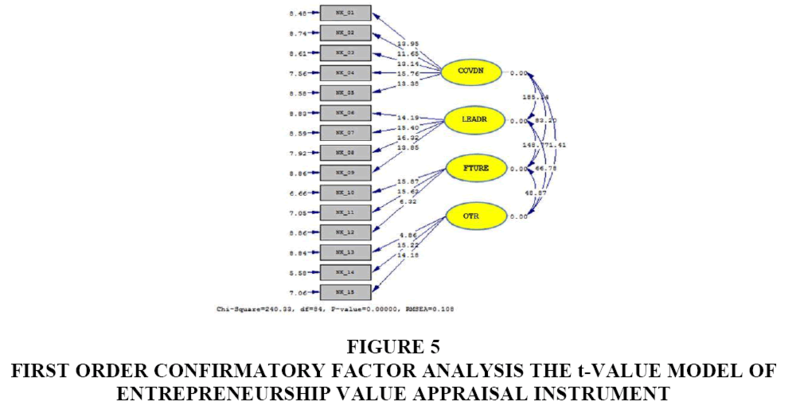 The research on the development of an instrument for assessing entrepreneurial affective domains is needed because entrepreneurship is valued in the cognitive and psychomotor domains. Attitudes and values in students after entrepreneurship learning are essential to be evaluated because they will inspire new understanding for students to become entrepreneurs in the future. Provide input in the development of entrepreneurial learning in high schools in the affective domain. Student entrepreneurship competencies can be developed by adopting the development of an affective domain assessment instrument in this study so that it becomes a reference for the development of materials to be taught and measured in entrepreneurial formation. 1. Knowing the development of affective assessment instruments in workshop subjects and entrepreneurship. 2. Knowing the steps to develop affective assessment instruments on entrepreneurial subjects in high school. 3. Knowing the validity and reliability of affective assessment developed. 4. Developing school entrepreneurship programs. Before conducting experimental experiments, affective assessment instruments were validated by experts who produced feedback in the form of the redefinition of assessment instruments and alternative answers. After that, there was a panelist validation involving six teachers consisting of workshop teachers and entrepreneurship, economics teachers, and counseling teachers. In the panelists, validation obtained by four statements states drop or invalid. The first trial was conducted involving 30 respondents. The formula used for the validity test is the Product Moment correlation of Pearson and reliability test with Alpha Cronbach. 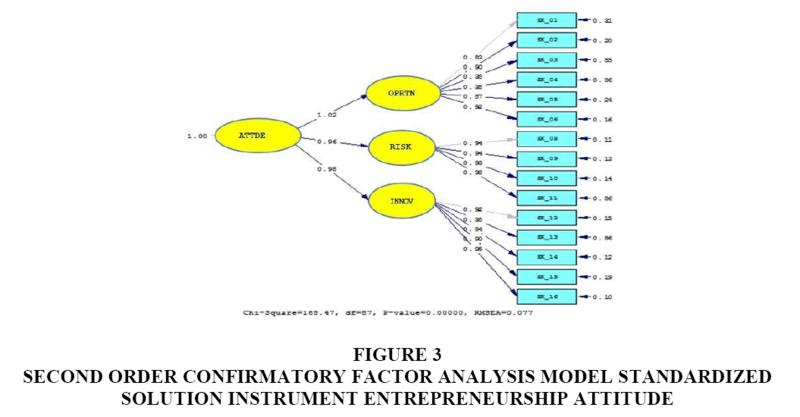 In this study standardization of affective domain, instruments were carried out on two dimensions of entrepreneurial attitudes and value of entrepreneurship within the student using confirmatory factor analysis. Good items have a valid loading factor coefficient on a significant measurement model at the 0.05 or 0.01 level with a standard loading factor ≥ 0.5 or a minimum of instrument items that have a loading factor>0.3. Next is validating items with the help of the lisrel program. 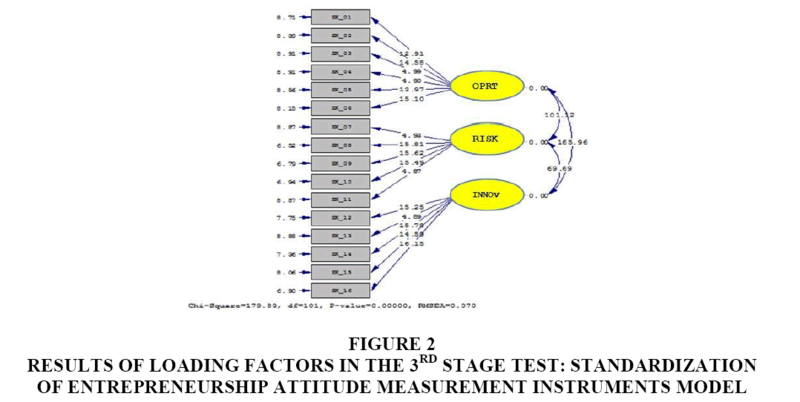 The developed affective evaluation instrument includes two assessments of entrepreneurial attitudes and entrepreneurial values, the first test with a limited scale is carried out to 30 students high school, validity test with Product Moment correlation of Pearson show each item is arithmetic>0.361. Means that each item is valid (able to measure what should be measured), and statistic reliability test Cronbach's Alpha showing the value of ≥ 0.7 so that the measuring instrument used is valid and reliable. Following the results of the loading factor test instrument entrepreneurship attitude (Figure 1). 1. Business Opportunities: Reading business opportunity, Capturing business opportunities, Leveraging business opportunities. 3. Innovation: The ability to innovate, Ability to develop business. In the above figure, the calculation uses t-value, indicating that all manifest variables have value t>1.96 at α=0.05 which can be interpreted that manifest variable with factor or indicator has significant value. Then tested again for the third time to see the consistency of indicator items and loading factor loading 0.5. Here's the table loading factor measurement model (Figure 2 and Table 1). The predicted CR and VE values above show the reliability value of the attitude. Assessment Instrument that has Met the Requirements. 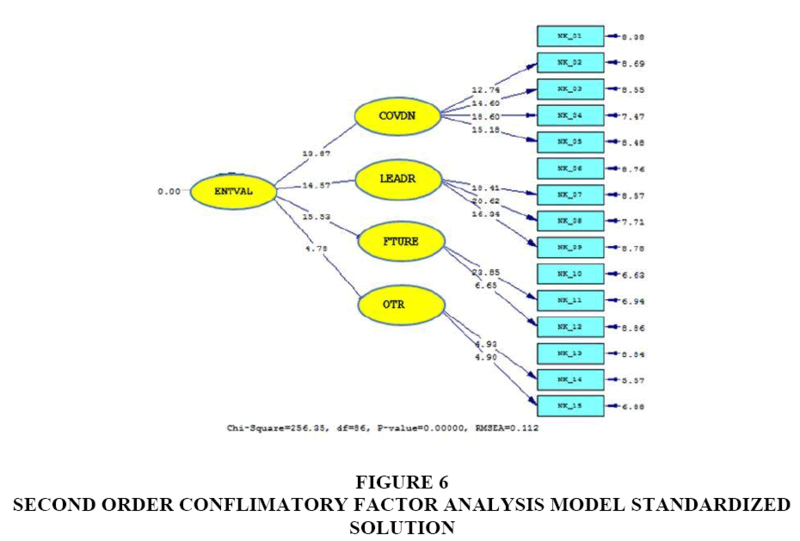 Meanwhile, on the measurement model Second Order Confirmatory Factor analysis without indicating indicator can be shown in the following figure (Figure 3). The Figure 3 shows that there is no difference with the previous order that only 1 item has the value less than 0.3, i.e., number 7 and 15 other questions declared valid. To determine the Goodness of Fit (GOF) in a model. Here are the results of a model matching test. In the above table (Table 2) of 13 GOF size criteria, 10 meet the fit criteria. Then it can be concluded that the overall fit of the model is good. The second instrument of affective judgment is the value of entrepreneurship within the student. The instrument of appraisal of entrepreneurship value is divided into four indicators that are confidence, leadership, future orientation, and task orientation and result. The assessment instruments tested were 15 statements (Figure 4). In this first test, of the 15 questions counted all eligible validity that has a value above 0.3. The figure (Figure 5) shows that all manifest variables have a value of t>1.96 at α=0.05 which can be interpreted that manifest variable with factor or indicator has significant value. Here's the table loading factor measurement model (Table 3). 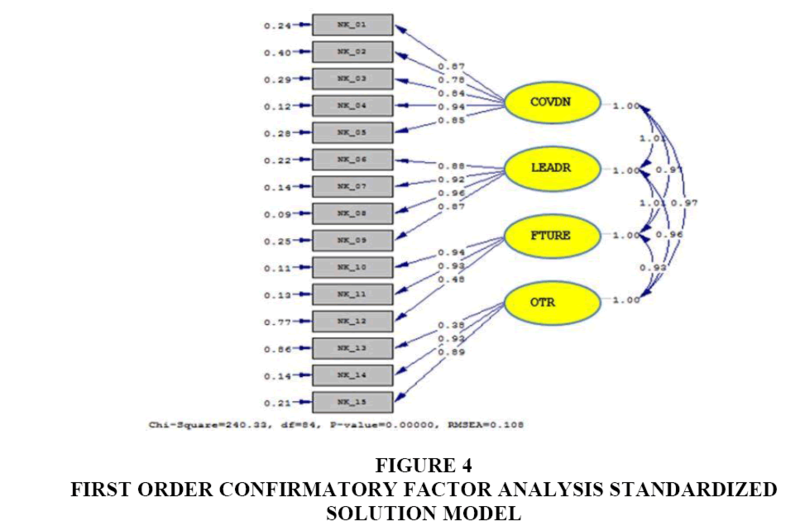 Meanwhile, on the measurement of model Second Order Confirmatory Factor of analysis without indicating indicator can be shown in the following figure (Figure 6). 2. Leadership: Be disciplined; Respect the opinions of others, Ability to find ideas. a) Inset the rumen of affective judgments on construction and entrepreneurship subjects in Senior high school has not been developed, and the assessment is insufficient. b) Measures to establish an affective appraisal instrument undertaken are to follow the development theory proposed by Mardapi (2012) and obtain the affective assessment instrument of the workshop and entrepreneurship. c) The affective appraisal and entrepreneurship assessment instruments have met the validity and reliability so that they can be used for affective judgments on the workshop and entrepreneurship lessons. Although this study has made a significant contribution in the development of instruments for measuring and evaluating entrepreneurial learning in high schools, the development of entrepreneurial affective domain learning indicators on attitudes and values in students is limited. This research only focuses on the assessment of the affective domain from a teacher with the learning process in school. Therefore, further research needs to be seen in the assessment of entrepreneurial skills in all aspects, and from a broader central perspective. Furthermore, based on the analysis of the model fit value will encourage the implementation of similar research in the future to confirm and refine the results of this study. Adams, W.K., & Wieman, C.E. (2011). Development and validation of instruments to measure learning of expert-like thinking. International Journal of Science Education, 33(9), 1289-1312. Ajzen, I. (1991). The Theory of Planned Behavior. Organizational Behavior and Human Decision Process. Ajzen, I. (2005). Attitudes, personality, and behaviour. Alma, B. (2011). Entrepreneurship.Bandung: Alfabeta. Astamoen, P.M. (2008). Enterpreneurship.Bandung: Alfabeta. Azwar, S. (2013). Human attitude: Theory and measurement. Yogyakarta: Pustaka Pelajar. Bandura, A., & R.H. Walters. (1963). Social learning and personality development. Bandura, A. (1971). Social learning theory. Daryanto. (2008) Educational evaluation.Jakarta: Rineka Cipta. Farkas, G. (2015). Appearance of entrepreneurial values and strategic orientations in the basic values. International Journal of Business & Management, 3(1), 18–35. Fernandez, T.M., Wilson, M.D., & Hoffmann, S.R. (2015). Development of entrepreneurial attitudes assessment instrument for freshman students. 122nd ASEE Annual Conference & Exposition, Seattle, WA. Fitzsimmons, J. (2005). Entrepreneurial attitudes and entrepreneurial intentions? : A cross-cultural study of potential entrepreneurs in India , China , Thailand And Australia. Semantic Scholar. Halis, M., Ozsabuncuoglu, I.H., & Ozsagir, A. (2007). The values of entrepreneurship and factors that effect entrepreneurship: Findings from Anatolia. Serbian Journal of Management, 2(1), 21-34. Hendro. (2011). The Basics of Entrepreneurship.Jakarta: Erland. Jabbarifar, T. (2009). The importance of classroom assessment and evaluation in educational system. Proceedings of the 2nd International Conference of Teaching and Learning. Jihad, A., & Abdul H. (2010). Evaluation of learning.Yogyakarta: Multi pressindo. Kunandar. (2014). Authentic assessment (assessment of student learning outcomes based on 2013 curriculum). Jakarta: PT Raja Grafindo Persada. Lovrich, N.P. (1998). Individual value preferences among American police officers The Rokeach theory of human values revisited. Policing: An International Journal, 21(1), 22-37. Mardapi, D. (2012). Measurement of educational evaluation & evaluation.Yogyakarta: Nuhamedika. Noor, M., & Shariff, M. (2009). 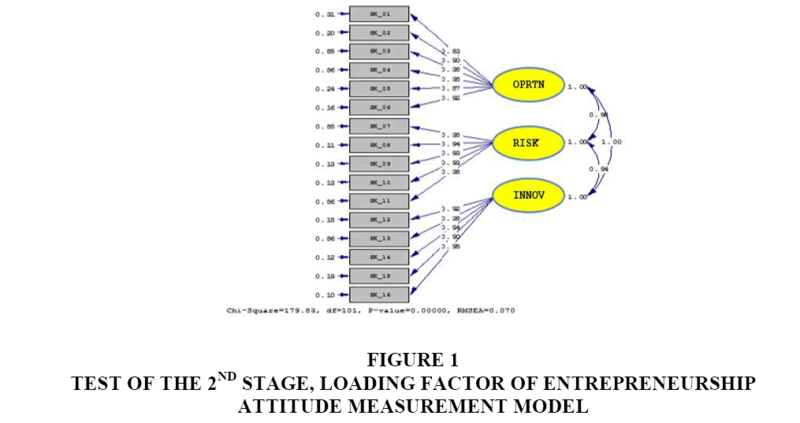 An attitude approach to the prediction of entrepreneurship on students at institution of higher learning in Malaysia. International Journal of Business and Management, 4(4), 129-135. Of, A.C., & Japanese, T.H.E. (2012). From dirt and scrap to gold: A vision for entrepreneurship in Indonesia. Innovations: Technology, Governance, Globalization, 7(1), 9-17. Pendidikan, K., Kebudayaan, D.A.N., & Isi, D. (2013). Curriculum document 2013. Suryana. (2006). Entrepreneurship (Practical guidelines: Tips and processes for success), 3rd Edition. Jakarta: Salemba Empat. Vivarelli, M. (2012). Entrepreneurship in advanced and developing countries? : A microeconomic perspective. IZA Discussion Paper, 6513.